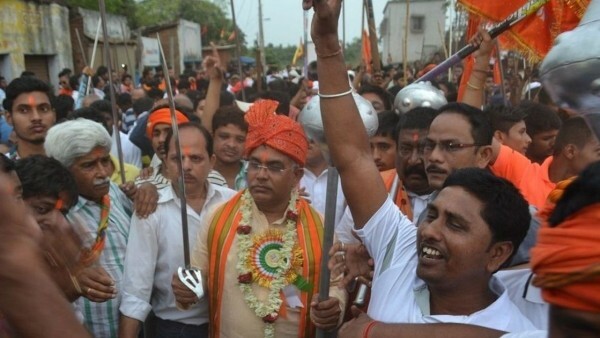 Militant hinduism: BJP Bengal chief leads a sword-wielding rally. Slamming the Bharatiya Janata Party for taking out armed rallies on the occasion of Ram Navami, West Bengal Chief Minister Mamata Banerjee charged the BJP of using religion to seek votes and incite violence. “They have introduced a new fake religion, which is not related to Hindus, Muslims, Sikhs, Christians and others. This new religion is not in line with culture of India and Bengal. They are fascists. We don’t do politics of religion and don’t need this either,” Banerjee said addressing a rally in Siliguri. Based on this newly introduced religion, they try to “create violence”, she added. “I do not visit any temple, church or mosque wearing the party badge to obey the model code of conduct. We are for all. Some political leaders are seeking votes carrying mace and sword. Whom are you planning to attack? It will not work in Bengal,” she said. Banerjee also said she was proud of the country’s armed forces but will never seek votes in the name of the army like Modi. Attacking the Congress and the Left Front, Banerjee urged people “not to vote the Left parties as they would not even secure a single Lok Sabha seat in West Bengal” while the Congress “should stop their got-up match”.